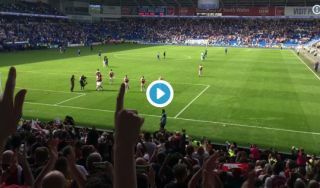 One Arsenal fan has tweeted this video featuring a classy moment from Arsenal goalkeeper Petr Cech at the end of the Cardiff City game at the weekend. The Gunners won 3-2 in a thrilling encounter, and this video clip appears to show Cech encouraging young midfield duo Lucas Torreira and Matteo Guendouzi to give their shirts to fans in the crowd afterwards. Cech is one of the most experienced members of this Arsenal squad and clearly sees the importance of acknowledging the fine away support they received in Wales on Sunday. Looks like Cech was advising Guendouzi and Torreira to go into the crowd and give their shirts to the supporters after the game.